Home / All Posts / Google Broad Core Algorithm Update: What is it and how to recover? 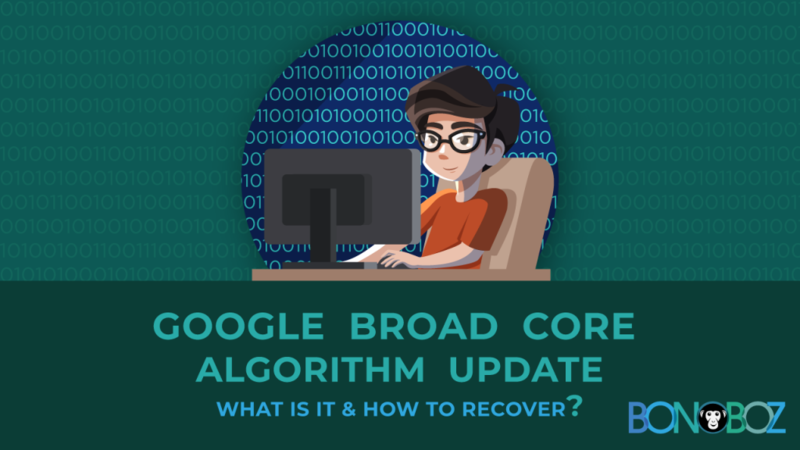 Google Broad Core Algorithm Update: What is it and how to recover? On August 1, 2018, Google announced an update to their core algorithm which is called Broad Core Algorithm Update. Google’s Danny Sullivan announced the update on the Google Search Liaison Twitter Account. So, here’s all you need to know about this recent algorithm update by Google. Google makes numerous algorithmic changes per year and often more than one per day. You might be aware of various Google algorithms like Penguin, Panda, Pigeon, Fred, Hummingbird, etc. Each algorithm addresses some specific flaws and issues in the Google Algorithms. But this is not a usual daily Google update. This update happens a few times per year to the core algorithm of the search engine. This update is, as the name suggests, broad and doesn’t focus on any one element of how a search engine works. Thus, the impact of this update is not specific but more central and far-ranging. As mentioned earlier, this update is about tweaking the value of every aspect of the search engine. So, you have nothing in your hand to fix. The main thing to keep in mind about this core algorithm update is that it didn’t “penalize” you for something but rewarded other websites more for something else. In short, many things change in such updates and the way they interact change too. So, there is no one suggestion for all. Every website that has lost its rankings will have a different solution. How to recover from Broad Core Algorithms Update’s effects? If your website rankings have been hit, stay strong! It’s just that Google’s algorithm found other websites with more EAT (expertise, authority, and trust) than your website. But keep following the SEO best practices to show Google that your website should rank higher. Many changes were made to the Google Quality Raters guidelines too that could have indirectly impacted the SEO on your site. Of these changes, the most relevant are related to distracting ads, misleading clicks, clickbait titles, hate speech, and misinformation. Check your site now to see if any of these relate to your website or not as that could possibly have indirectly affected your site rankings. This is as simple as it gets. If you are with Google, Google will be with you. Read Google Quality Raters Guidelines for better insights. Make the proper use of Title tags, Heading tags, Meta descriptions, and keywords and make your website architecture look clean for Google too. Revamp your content strategy and focus on creating high-quality content for your target query and target audience. The importance of these elements in SEO is huge. Check that your images have ALT tags, media files are of appropriate size and the links are not broken. Remove the technical errors from your web pages. You off-page SEO strategy will not work accurately if your website has technical errors to fix. Check your competitors’ sites and watch their performance. What is it that they are doing right, and you are not. Work on amping up your site’s EAT. The Broad Core Algorithm Update affected the health and finance sites the most due to several reasons. If your site has been affected, focus on working on all the elements that can help your website rank higher. Most importantly, take a closer look at your competitors’ and your SEO strategies and keep a track of updates in Google’s Quality Raters guidelines. As you know, in SEO, even minor changes can have a big impact on your rankings. However, Google will still give a refresh to this update. So, things can continue to go up and down. Just adjust and move forward.